LG unveils 2018 4K OLED and LCD TV ranges | What Hi-Fi? 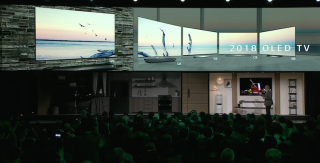 LG's TV highlights for 2018 includes five different OLED TV ranges, Nano Cell LCD TVs with full-array backlighting and local dimming, and the integration of Google Assistant. LG's OLED TV line-up consists of W8, G8, E8, C8 and B8 ranges, with all bar B8 powered by a new Alpha 9 picture processor (B8 uses a new version of LG's Alpha 7 processor). LG's gone big on picture enhancement this year, with claimed improvements in noise reduction, depth enhancement and colour reproduction. Also new for 2018 is support for high frame rates up to 120fps (frames per second). LG has also added dynamic processing to HDR formats HDR 10 and HLG - both of these tend to use static metadata but LG claims HLG Pro and HDR 10 Pro will be able to enhance the picture quality of these two formats even further. Besides its OLED offerings, LG also has new Nano Cell LCD TVs for 2018. The headline news for the SK95, SK85 and SK80 ranges is the inclusion of full array LED backlighting with local dimming. Dolby Atmos audio support features across both TV technologies this year, as does LG's 4K Cinema HDR picture processing. Screen sizes will range from 55in to 77in. Since the press conference, LG has confirmed that the US and Korea will be the only markets at launch to get full Google Assistant built into both its Nano Cell and OLED TVs. For all other markets, the TVs are Google Assistant compatible, meaning you'll need to use a wireless speaker or other product that features Google Assistant to interact with your LG TV in this way.